Hello! I have missed you all! Been super busy with school... but I love it! I love going to CAL! It's so much fun. I am making a lot of cool friends, and getting re-acquainted with an old friend. Everything is so cool at CAL. My past projects have been my world for the past three weeks. 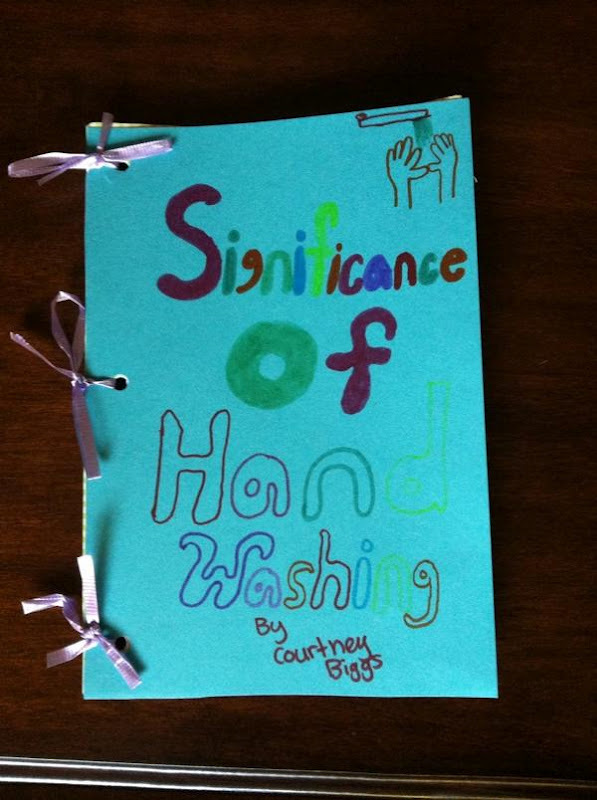 I made a cute picture book about the importance of hand washing and all the things that could happen if you don't wash your hands. 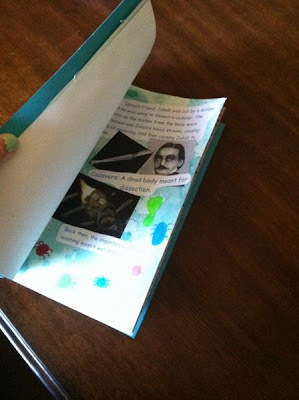 I got a 95/100 on it because I added too much text and too little pictures... since it is a picture book. I am happy with my grade though. Here is the cover and a selected page out of my book. 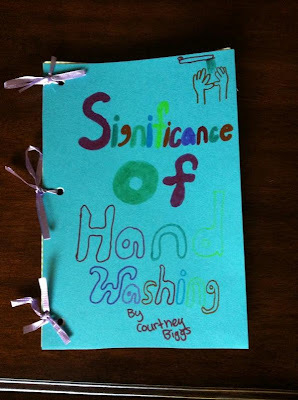 My other project is a poster showing the steps of hand washing. It was for a contest and the grade. The contest was the kids in my Applications and Practices in Health Care walked around the front of the room, looking and voting on the best poster. I wanted to win that and get the 100%. I came up with this idea for my group, and it was a 3D sink, with clay hands and blue mesh and cotton balls for water and soap suds. Punch holes in the top of the trifold and hang Bath and Body Works hand sanitizes from the top. It turned out to be super cool looking! And got a lot of attention. The number 6 on there is not the place of the poster, it's just the number of the poster.The kids had to walk around, write the number of the poster on a piece of a paper, and turn it into the teacher. Which ever poster got the most votes wins. We got second place. I don't know why we didn't get first place. The first place poster was cool looking, but it wasn't 3D, it didn't have any kind of visual. It had pictures of the steps for washing your hands, but nothing nifty.We got 97% though. Not bad and I am happy with my grade. The second place ones still get displayed though! That's good. My next little project I did was very recent. This week recent. In French, we read this poem, Page d'ecriture by Jaques Prevert. It was about children in school, bored with the class. They turn to the window for some kind of savior. They see a bird and the bird plays with their imagination. It's a very visual poem. So, for an assignment, we had to illustrate the poem. I was really excited because I had a set mind of what I wanted to draw. When we have to draw something for French, I take 12 minutes total on it. I draw stick figures and stupid trees and stuff. I don't put my heart into it at all. But this illustration, I wanted to take my time on, and actually be proud of it. So, I drew what was in my mind and it turned out exactly how I wanted it. I did all of this free hand. I am so proud of myself! So, that's what I have been working on lately. Been doing other homework, and been busy with family and just trying to find time to relax. Last week, I went to a Gresham Football game. Not a Barlow one. I didn't feel like being with Barlow people. I went with my cousin Abbie, and saw my friend Kelly who cheers for Gresham. It was fun! Earlier that day, the clouds were spectacular. After we went home, I got ready for the game, and then went to the game with my cousin Abbie. 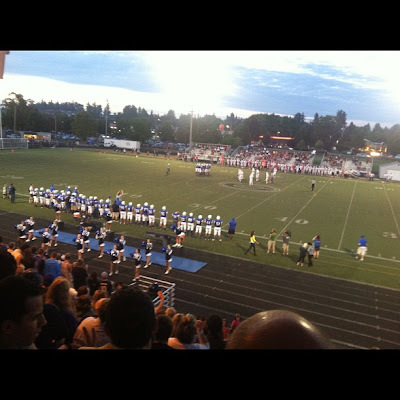 I kinda wish I went to Gresham, but I'm alright with Barlow. 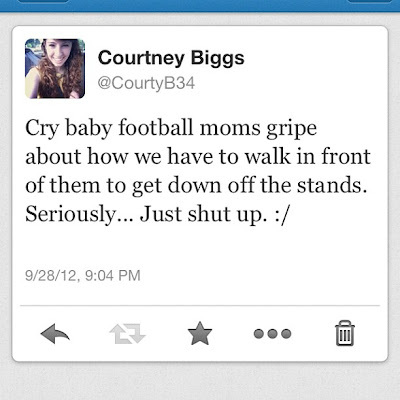 These people that were sitting down the bleachers from us, they were really annoying. 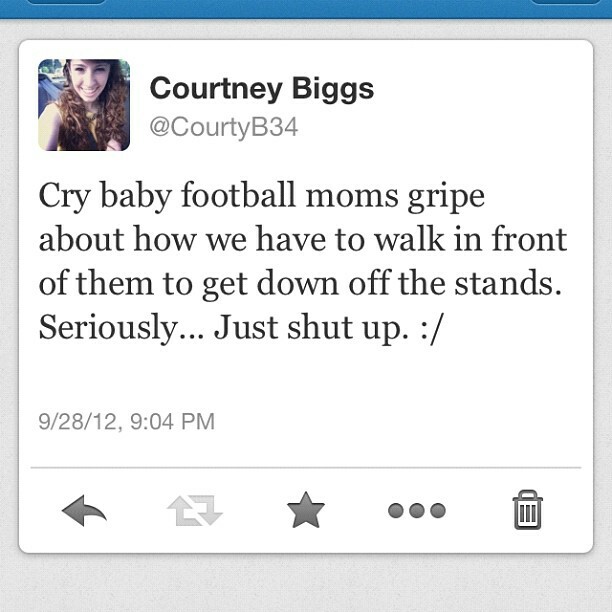 Here is the tweet that I tweeted during the game...it explains it all. On Wednesday, we went to Old Navy and I got these awesome colored cords skinnies. 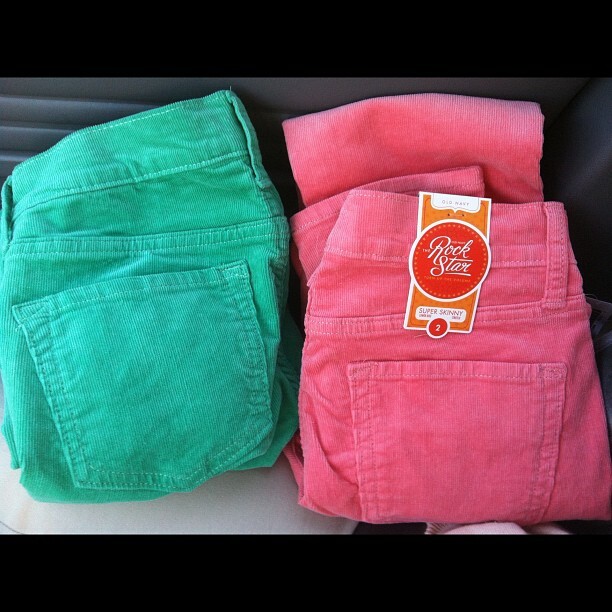 I got coral and a dark mint color. My friend, Kenna, inspired me because she got the same cords. I need color in my life, so I got them and I am really happy with them! I wore the coral ones on Thursday, and I felt pretty confident in them. I am going to wear the mint ones probably sometime this next week.We only have a three day week this week! I am so excited for the four day weekend. 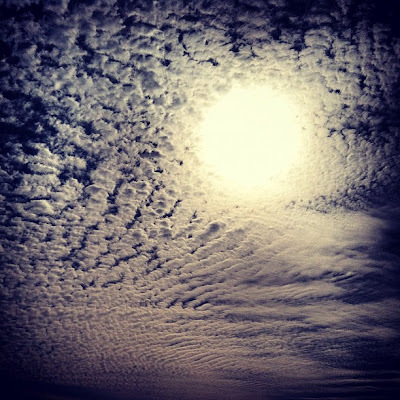 For the month of October, I am doing an October Photo A Day Challenge on instagram. I will post all the pictures at the end of the month. I think I am going to make it a ritual. Every month, I am going to do the Photo A Day Challenge, and at the end of each month, I will post all the pictures from that month. It's going to be a fun project. I also need to bake soon. I haven't baked in long time. I need to make some kind of food something! I have stuff on my blog ideas list to make, so maybe this four day weekend, I will make something. Actually, that will be perfect since I am hanging out with my BEST FRIEND this weekend. I can make something to bring over there, and blog about it and then blog about us eating it and having fun. I miss Kenzie! ha. So, if you want to see the photos from October Photo A Day Challenge, just go to my instagram, it's on the side bar of my blog, and the pictures will be labeled, #octoberphotoadaychallenge and #octoberphotoaday. I really need blog more often! I need to get back in the habit of doing that. I hope you enjoyed the post! I will blog more! Your projects turned out great! 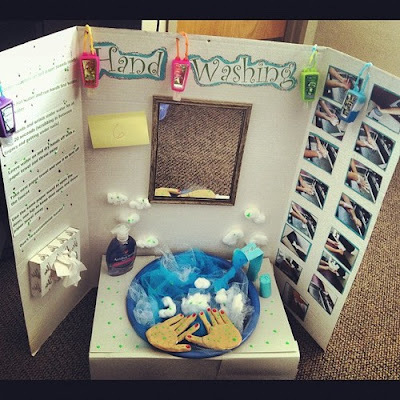 I love the 3D Hand Washing display, Sarah and Joe have showcase events where they have to make displays like that a couple of times a year, and it is always fun to see what kids come up with. I think the 3D sink is brilliant, totally first place! 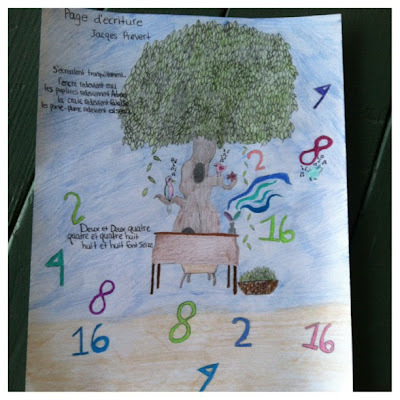 :) Wonderful tree drawing as well, projects are fun! Projects are fun! But a lot of hard work. I like presenting them because then I can "wash my hands" of the project! :) thanks April! Your comments always make my day!